For the village in the municipality of Venray, see Ysselsteyn. IJsselstein (Dutch pronunciation: [ˈɛisəlstɛin] ( listen )) is a municipality and a city in the Netherlands, in the province of Utrecht. IJsselstein received city rights in 1331. 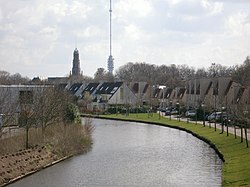 IJsselstein owes its name to the river Hollandse IJssel which flows through the city. It is a major commuting suburb for the Utrecht area, along with neighbouring towns Houten and Nieuwegein (in part due to the Sneltram light rail line serving the area). It's surrounded by the municipalities of Utrecht, Montfoort, Lopik, Vianen and Nieuwegein. The Hollandse IJssel is a branch of the Rhine delta that flows westward from Nieuwegein on river Lek through IJsselstein, Gouda and Capelle aan den IJssel to Krimpen aan den IJssel, where it ends in the Nieuwe Maas. Another branch called Enge IJssel flows southwest from Nieuwegein. The name IJssel is thought to derive from the Germanic i sala, meaning "dark water". Originally, the Hollandse IJssel forked off from river Lek at Nieuwegein, but the connection was cut off with the Hollandse IJssel nowadays only draining the surrounding pastures. The city has an old town, surrounded by a small canal. A castle stood in IJsselstein from 1300 to 1888; the tower survived. The city has two large churches, both named after St. Nicholas: the Dutch Reformed Nicolaas church, founded in 1310, and a Roman Catholic one. Inside the Protestant church there are two mausoleums; one of the family of Gijsbrecht van Amstel (1350) and another one of Aleida van Culemborg [ nl ] (1475). The catholic basilica of St. Nicolaas dates from 1887 and is neo-gothic. It was given the title of 'Basilica Minor' by Pope Paul VI in 1972. The Dutch Reformed Church was the largest Christian denomination in the Netherlands from the onset of the Protestant Reformation until 1930. It was the foremost Protestant denomination, and—since 1892—one of the two major Reformed denominations along with the Reformed Churches in the Netherlands. A 366.8 metres high television mast, called the Gerbrandy Tower, is located in IJsselstein. The tower is commonly, and erroneously, referred to as Zendmast Lopik, after the nearby village of Lopik. The Gerbrandy Tower is a tower in IJsselstein, the Netherlands. It was built in 1961. 1649 map of IJsselstein in Willem and Joan Blaeu's "Toonneel der Steden"
Willem Janszoon Blaeu, also abbreviated to Willem Jansz. Blaeu, was a Dutch cartographer, atlas maker and publisher. 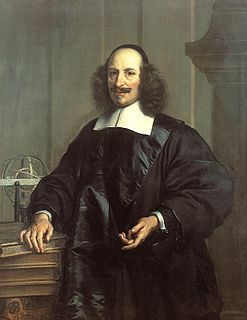 Along with his son Johannes Blaeu, Willem is considered one of the notable figures of the Netherlandish/Dutch school of cartography in its golden age. Joan Blaeu was a Dutch cartographer born in Alkmaar, the son of cartographer Willem Blaeu. Tower of the former castle. Oss is a municipality and a city in the southern Netherlands, in the province of North Brabant. Culemborg is a municipality and a city in the centre of the Netherlands. The city has a population of 27,973, and is situated just south of the Lek river. Direct train lines run from the railway station towards the cities of Utrecht and Den Bosch. Druten is a municipality and a town in the eastern Netherlands. The municipality covers the eastern part of the Land van Maas en Waal region of the province of Gelderland. One of its key features is the town's church, designed by architect Pierre Cuypers. The church is dedicated to the Two Ewalds, with statues for the two made in the studio Atelier Cuypers-Stoltzenberg, owned by Cuypers and Frans Stoltzenberg. Scherpenzeel is a municipality and a town in the Dutch province of Gelderland. As of 2017, it has a population of 9,724, with approximately 6,000 possessing suffrage. The community of Scherpenzeel also contains a part of the hamlet Moorst. Oudewater is a municipality and a town in the Netherlands. Rhenen is a municipality and a city in the central Netherlands. The municipality also includes the villages of Achterberg, Remmerden, Elst and Laareind. The town lies at a geographically interesting location, namely on the southernmost part of the chain of hills known as the Utrecht Hill Ridge, where this meets the river Rhine. Because of this Rhenen has a unique character with quite some elevation through town. Veenendaal is a municipality and a town in central Netherlands, it is part of the province of Utrecht. Veenendaal is the only population centre within its administrative borders. The municipality had a population of 64,629 in 2017 and covers an area of 19.72 km2 (7.61 sq mi). Wijk bij Duurstede is a municipality and a city in the central Netherlands. Oosterhout is a municipality and a city in the southern Netherlands. The municipality had a population of 55,005 in 2017. Schoonhoven is a city and former municipality in the western Netherlands, in the province of South Holland. Since 2015 it has been a part of the municipality of Krimpenerwaard. Benschop is a town in the Dutch province of Utrecht. It is a part of the municipality of Lopik, and lies about 4 km west of IJsselstein. Benschop is an extremely long village: apart from a relatively compact town centre, it consists of a long ribbon of houses on both sides of the Benschopsche Wetering. Cabauw is a village in the Dutch province of Utrecht. It is part of the municipality of Lopik, and lies about 12 km southwest of IJsselstein. Cabauw consists of a small village centre, and a ribbon of farms along the Lopikerwetering canal, between Zevender and Lopik. Jaarsveld is a town in the Dutch province of Utrecht. It is a part of the municipality of Lopik, and lies about 7 km southwest of IJsselstein. ↑ "Samenstelling" [Members] (in Dutch). Gemeente IJsselstein. Archived from the original on 8 April 2014. Retrieved 7 April 2014. ↑ "Postcodetool for 3401BK". Actueel Hoogtebestand Nederland (in Dutch). Het Waterschapshuis. Archived from the original on 21 September 2013. Retrieved 7 April 2014.